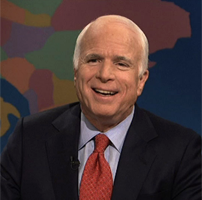 Showing 1 - 15 of 21 articles tagged "John McCain"
Meghan McCain is still reeling from her dad John McCain's death: "I’m in therapy, I’m in counseling"
The View co-host was mostly teary in a recent interview with Porter magazine. In a late schedule change, the network announced today that it will re-air the late senator's Oct.
Will Meghan McCain appear on The View's season premiere following John McCain's death? Next Monday's season premiere is two days after her father John McCain's funeral. The clip of the awkward transition went viral on Sunday. “It cracks me up," Meghan McCain says of The View conversations she has with her U. In the documentary premiering on Memorial Day, the U.
John McCain: For Whom the Bell Tolls debuts Monday, May 28.